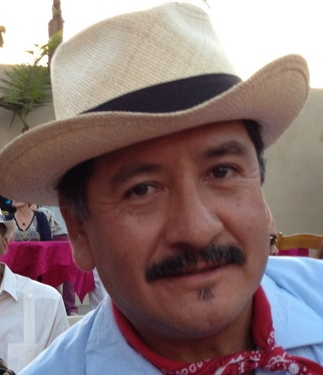 A native of Xalapa, Veracruz, Mexico, Betto Arcos is an independent radio producer and host of KPFK’s world music show Global Village (Tuesdays, 11am-1:00pm, PST), a daily program he created as music director in 1997. Since 2009, he’s been a regular contributor to PRI's The World and NPR’s Weekend All Things Considered, covering Latin and world music. In addition to his public radio work, Betto co-produced three award-winning experimental radio art collaborations with performance artist Guillermo Gomez-Peña. Betto has also helped with a number of recording projects, including Ry Cooder’s “Chavez Ravine” and Lila Downs’ "La Cantina." Betto collaborated as music supervisor in the documentary films “Calavera Highway” by Renee Tajima-Peña and “2501 Migrants: A Journey” by Yolanda Cruz. In 2002, he developed and helped teach the music portion of Prof. David Carrasco’s course “Religion in the Latin American Imagination” at Harvard University. Betto graduated with honors in journalism from the University of Colorado. Betto is a foodie with no boundaries, enjoying tequila Fortaleza and rum Zacapa from Guatemala. There's plenty more than Buena Vista Social Club. This Sunday, Colombians will vote on the peace agreement signed by the government and the FARC guerrillas, ending 50 years of war. At the annual music industry festival known as Bogota Music Market, young musicians there were eager to talk about the prospect of peace. A pop performer known for his flamboyancy on stage, prolific songwriting and bestselling tunes, Juan Gabriel died over the weekend of a heart attack. He was 66. Cuban singer-songwriter Silvio Rodriguez does pop-up concerts in poor neighborhoods throughout Cuba. But he doesn't want the media to know that. The famed Colombian novelist influenced fiction writers around the world. A major source of inspiration for his own work was a form of Colombian folk music called Vallenato. Mateo Kingman grew up in a small town deep in the Amazon. He didn't know the depth of his connection to the jungle until it moved to the city, where music helped him cope. We remember one of the great singers of Afro-Cuban music. But he wasn't Cuban. "Melón" died on Monday in Mexico City at the age of 85. La Cuneta Son Machín is a band from Nicaragua composed of young musicians whose older family members were musical superstars during the Sandinista regime. They didn't want to sound old, but they wanted to use the same record producer, which has resulted in a Grammy nomination.